Use the Hummingbird Kit to learn about human body systems. Students will research their chosen body system to explain its function and purpose. Students will work in a group to design, build, and program a robotic model that represents the body system. 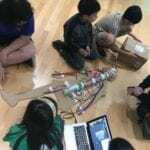 Students will present their model to the class and/or parents to explain how their robotic model illustrates the way that the body system functions. Students will explain the importance of their body system and how that system can help them maintain their personal health. This project is aligned with Next Generation Science Standard 4-LS1-1, “Construct an argument that plants and animals have internal and external structures that function to support survival, growth, behavior, and reproduction.” It also incorporates Common Core ELA standards in speaking and listening (CCRA.SL.1, CCRA.SL.4, and CCRA.SL.5).